Video of the encounter has been seen more than 1.5 million times. Guests at a lodge in B.C. were treated to the majestic sight of humpback whales visiting for breakfast. PORT HARDY, B.C. 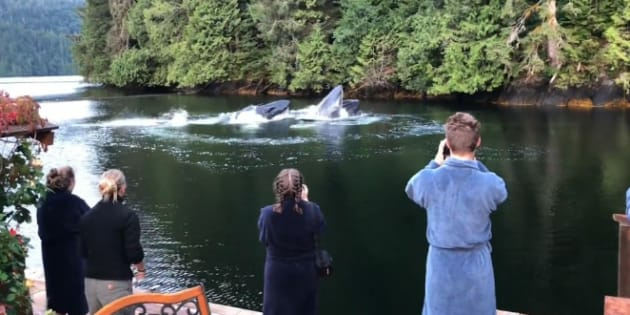 — Tourists staying at a lodge on a Vancouver Island were treated to a spectacular show when a group of humpback whales visited for breakfast. "One of them will swim in a circle around fish, and as it's doing it, it will release air from its blowhole, and basically create a net of bubbles," she says. "Then the fish get more and more concentrated ... so (the whales) will get a lot more of them in each mouthful." Those people will go away with a memory they will never forget for the rest of their lives. "I love watching her body language as much as the whales, because she's so excited to see it," laughs Leehane. "Our guests, who have never seen anything like this before ... those people will go away with a memory they will never forget for the rest of their lives."